Looking for an easy but elegant recipe for eggs? Try making a Frittata! Fancier than scrambled eggs and easier than an omelette, frittats are a great way to get both your protein and your vegetables in the same dish. You can put all sorts of things in a fritatta; cheese, uncured bacon, chicken, and just about any vegetable you can imagine are all fair game. It’s a great way to recycle last night’s leftover vegetables, taco toppings, or spinach salad. And, you don’t have to stand over the stove and flip eggs! 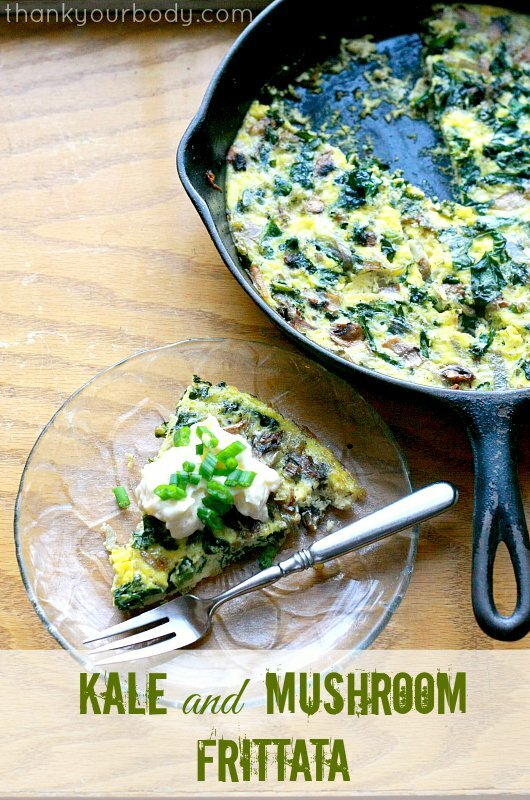 One of my favorite breakfast dishes is Kale and Mushroom Fritatta. 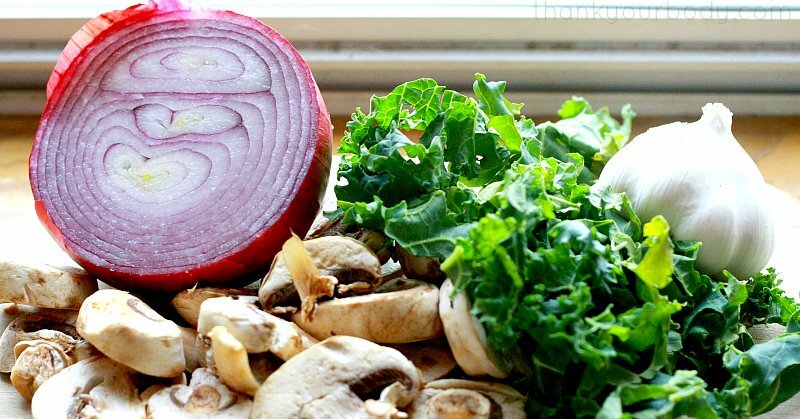 Fresh, organic kale, red onion and mushrooms give this dish a lot of healthy vitamins and minerals, and organic, cage-free eggs pack a lot of protein. Somewhere between an omelette and a crustless quiche, the frittata is served in wedges and looks elegant on a plate. Add a few garnishes…some fresh sour cream, a little salsa, a sprinkle of green onions or some fresh herbs…and you have a really nice main dish for breakfast or brunch! Just heat a little coconut oil in a cast iron skillet, add your vegetables, and saute them for a few minutes. If you’re using left over vegetables (or taco toppings), you can skip this step. Just oil the skillet, toss the veggies in, and you’re good to go! Then, beat your eggs with a little raw milk or cream, some herbs, and a sprinkle of sea salt. It helps to beat them really well, to incorporate a little air into the eggs. They’ll bake up a little fluffier if you spend an extra minute on this step. Pour the eggs over the vegetables in the skillet, without stirring them. Then, just put the whole skillet into the oven and bake it! It only takes about 20 minutes to bake, and you can transfer the skillet right from the oven to the table. Just slice, garnish, and serve! This is a great recipe to experiment with, there are endless options for what you can add to a frittata. Spinach, goat cheese, sun dried tomatoes and basil? Or maybe artichoke hearts, mushrooms, bacon and black olives…the options are limitless. I’ve even been known to serve frittata for dinner, with a side of fresh fruit! 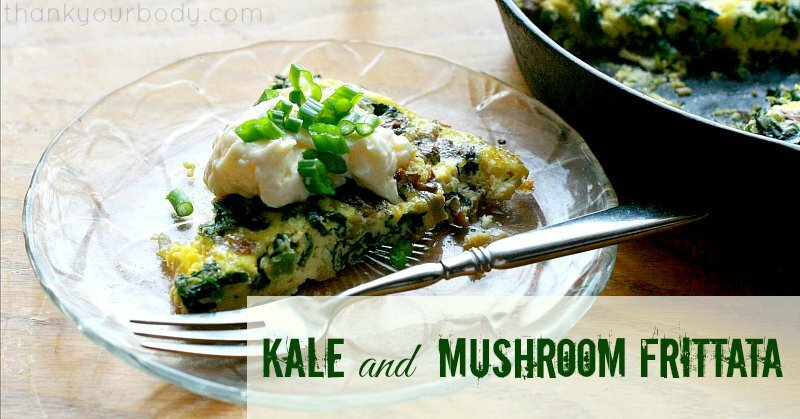 For me there is nothing like a good frittata to start your morning off right - this kale and mushroom frittata is simple and delicious and a great breakfast. Heat the coconut oil in a cast iron skillet. Add the kale and onions, and saute until they are tender. Add the mushrooms and garlic and saute a few minutes more. Remove the skillet from the heat. In a bowl, beat the eggs, cream or milk, and herbs. Beat well. Pour the egg mixture over the vegetables in the skillet, do not stir. Place the skillet in the preheated oven, and bake for 20 minutes or until a knife inserted in the center comes out clean. Cut into wedges, garnish, and serve. What ideas do you have to try in a fritatta?